Lunatone does not evolve/is not evolved into. X Because it turns active on nights of the full moon, it is said to have some link to the lunar phases. X Da es in Vollmondnächten aktiv wird, sagt man ihm nach, mit den Mondphasen in Verbindung zu stehen. X On suppose qu’il est lié au cycle lunaire, car il ne sort que les soirs de pleine lune. X Se piensa que está muy influido por las fases lunares, ya que solo actúa en noches de luna llena. X Diventa attivo nelle notti di luna piena, pertanto si dice che abbia qualche legame con le fasi lunari. X 보름달의 밤이 되면 활발하게 활동하기 때문에 달의 변화와 관계 있다고 전해진다. Y It was discovered at the site of a meteor strike 40 years ago. Its stare can lull its foes to sleep. Y Wurde erstmals vor 40 Jahren bei einem Meteoritenkrater entdeckt. Sein Blick wirkt einschläfernd. Y Il a été découvert dans le cratère d’une météorite il y a 40 ans. Son simple regard endort ses ennemis. Y Descubierto hace 40 años junto a un meteorito. Duerme a sus enemigos con solo mirarlos. Y Fu scoperto 40 anni fa nella zona d’impatto di un meteorite. Con il solo sguardo addormenta il nemico. Y 40년 전에 운석이 떨어진 장소에서 처음 발견되었다. 노려보는 것만으로 적을 재운다. 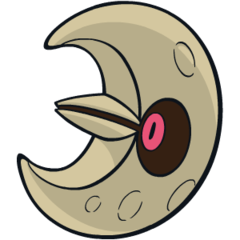 Omega Ruby Lunatone becomes active around the time of the full moon. Instead of walking, it moves by floating in midair. The Pokémon’s intimidating red eyes cause all those who see it to become transfixed with fear. Omega Ruby Lunastein wird bei Vollmond aktiv. Es läuft nicht, sondern schwebt durch die Luft. Die bedrohlichen roten Augen dieses Pokémon lassen alle, die es sehen, vor Angst erstarren. Omega Ruby Séléroc ne s’active que pendant la période de pleine lune. Il ne marche pas, mais se déplace en lévitant. Les yeux rouges et intimidants de ce Pokémon pétrifient ses ennemis de terreur. Omega Ruby Lunatone entra en actividad en épocas de luna llena más o menos. No camina, se desplaza flotando por el aire. Tiene unos ojos rojos sobrecogedores que cortan la respiración a todo aquel que los ve. 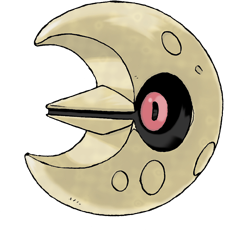 Omega Ruby Lunatone si desta quando domina la luna piena. Invece di camminare, fluttua a mezz’aria. I suoi occhi rossi così minacciosi terrorizzano chiunque li guardi. Omega Ruby 보름달일 때 활발해지는 습성이 있다. 공중에 떠서 이동하며 빨간 눈동자는 그것을 본 자를 움츠러들게 하는 박력을 지녔다. Alpha Sapphire Lunatone was discovered at a location where a meteoroid fell. As a result, some people theorize that this Pokémon came from space. However, no one has been able to prove this theory so far. Alpha Sapphire Lunastein wurde in der Nähe eines Meteoritenkraters entdeckt. Daher nehmen einige Menschen an, dass dieses Pokémon aus dem Weltall stammt. Diese Theorie konnte allerdings bisher noch nicht belegt werden. Alpha Sapphire Séléroc fut découvert à côté d’un cratère de météorite. Du coup, certaines personnes pensent que ce Pokémon vient de l’espace. Cependant, rien ne peut prouver cette théorie pour le moment. Alpha Sapphire Lunatone fue descubierto en el lugar de impacto de un meteorito. Por eso, hay quien especula con la idea de que procede del espacio. Con todo, hasta el día de hoy nadie ha podido probar esta teoría. Alpha Sapphire Lunatone è stato scoperto nel luogo dove una volta cadde un meteorite. Si è pertanto dedotto che questo Pokémon venga dallo spazio. Tuttavia, questa teoria non è ancora stata confermata. Alpha Sapphire 운석이 떨어진 장소에서 발견되어 우주에서 온 포켓몬이라는 설도 있지만 아직 증명되지 않았다. Ruby Lunatone was discovered at a location where a meteorite fell. As a result, some people theorize that this Pokemon came from space. However, no one has been able to prove this theory so far. Sapphire LUNATONE becomes active around the time of the full moon. Instead of walking, it moves by floating in midair. The POKeMON's intimidating red eyes cause all those who see it to become transfixed with fear. LeafGreen Its health ebbs and flows with the lunar cycle. It brims with power when exposed to the light of the full moon. Diamond Because it turns active on nights of the full moon, it is said to have some link to the lunar phases. Pearl Because it turns active on nights of the full moon, it is said to have some link to the lunar phases. Platinum Because it turns active on nights of the full moon, it is said to have some link to the lunar phases. SoulSilver It was discovered at the site of a meteor strike 40 years ago. Its stare can lull its foes to sleep. Black Because it turns active on nights of the full moon, it is said to have some link to the lunar phases. White Because it turns active on nights of the full moon, it is said to have some link to the lunar phases. Black 2 The phase of the moon apparently has some effect on its power. It’s active on the night of a full moon. White 2 The phase of the moon apparently has some effect on its power. It’s active on the night of a full moon.